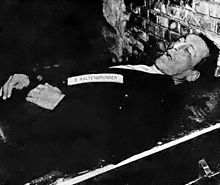 Ernst Kaltenbrunner (4 October 1903 – 16 October 1946) was an Austrian-born senior official of Nazi Germany during World War II. An Obergruppenführer (general) in the Schutzstaffel (SS), between January 1943 and May 1945 he held the offices of Chief of the Reich Main Security Office (Reichssicherheitshauptamt; RSHA). He was the highest-ranking member of the SS to face trial at the first Nuremberg trials. He was found guilty of war crimes and crimes against humanity, and executed by hanging.